The pattern is apart of the Jeanette Crews Designs, One Nighter Series, Book # 418. 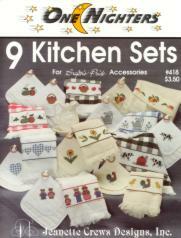 The pattern displays 9 different designs for kitchen sets. With Supplies: $29.82 We will ship you the printed design, 26 skeins of DMC Floss & Wichelt 14ct. 18" x 21" Aida (Ivory) to complete your project.